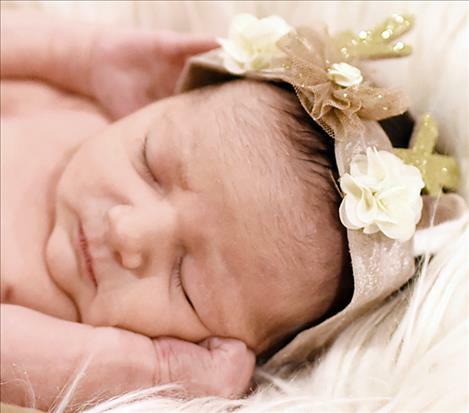 POLSON — Addison Rose Beard was born Dec. 10, 2017, at the Nesting Place in Providence St. Joseph Medical Center. She was 19 inches long and weighed 6 pounds, 14 ounces. Addison’s parents are Megan and Jon Beard of Polson. Maternal grandparents are Janet and John Dochnahl. Paternal grandparents are Gina and Paul Beard. RONAN - Hazey-May Marie Shepard was born Dec. 6, 2017, at St. Luke Community Hospital. 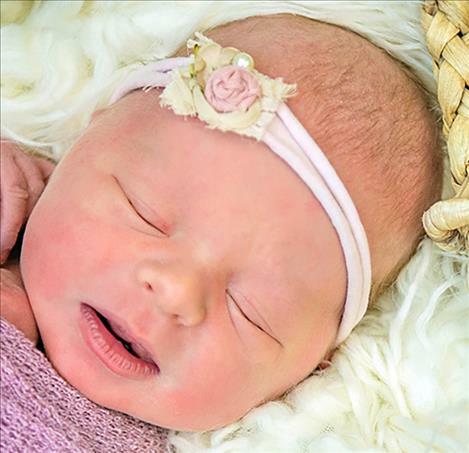 She weighed 6 pounds, 3 ounces and joins siblings Vincent, Leelyn and Dallas. Parents are Vincent Shepard and Hayley Rosenbaum of St. Ignatius. Paternal grandparent is Andrea Adams of St. Ignatius. Maternal grandparents are Jayne and Charlie Hoffman and Steve Rosenbaum of Ronan. 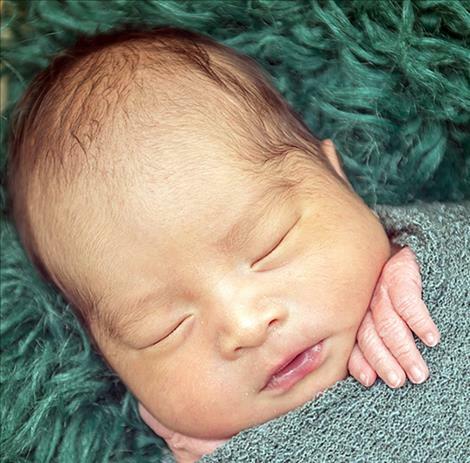 POLSON — Nalhai and Sunflower are excited to announce the birth of brother, Isaiah Elgie Thomas Jr. 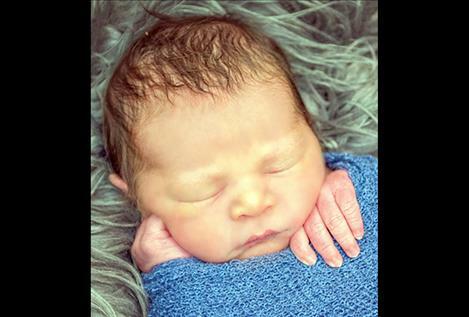 He was born on Dec. 9, 2017, at the Nesting Place in Providence St. Joseph Medical Center. 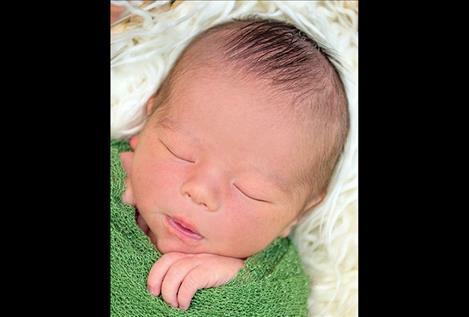 Isaiah was 20 and one-half inches long and weighed 7 pounds, 10 ounces. His parents are Ontegua Matt and Isaiah Thomas of Ronan. Maternal grandparents are Waleya Rossbach and Carl Matt. Paternal grandparents are Mary Alice and Bruce Thomas. POLSON —Cloe and Jewish Dala are excited to announce the birth of brother, Joshua Virgil Miller Jr. Joshua was born Nov. 20, 2017, at the Nesting Place in Providence St. Joseph Medical Center in Polson. He was 20 inches long and weighed 7 pounds, 3 ounces. Joshua’s parents are Winky-Jane and Joshua Miller Sr. of Ronan. Maternal grandparents are Gloria and Jovito Dala. Paternal grandparents are Becki and Jerry Jarvis. Paternal great-grandparents are Colleen Coulter and Jim Oberembt. RONAN — Kellen Curtis Kovarik-Azure was born Nov. 22, 2017, at St. Luke Community Hospital. He weighed 7 pounds, 12 ounces. 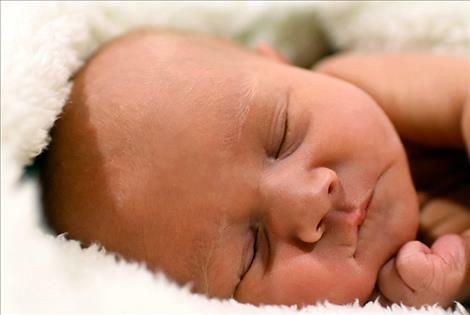 Parents are Eliah Ben Azure-DeFrance and Kelsie Kovarik of Polson. Paternal grandparents are Shannen DeFrance and LaNada Azure of Polson. Maternal grandparents are Curtis Kovarik and Christine Johnson of Polson. POLSON — Kneon White-Owl Ortega was born Dec. 4, 2017, at the Nesting Place in Providence St. Joseph Medical Center. He was 20 inches long and weighed 6 pounds, 11 ounces. His mother is Lyne Ortega of Hot Springs. Kneon joins sibling Nakoah in the Ortega home. Maternal grandparents are Tammie Ortega and Billy McDougall. Maternal great-grandparents are Linda Maltare and Harriot McDougall. POLSON —Lexi TenBear is proud to announce the birth of brother Logan Frank TenBear. 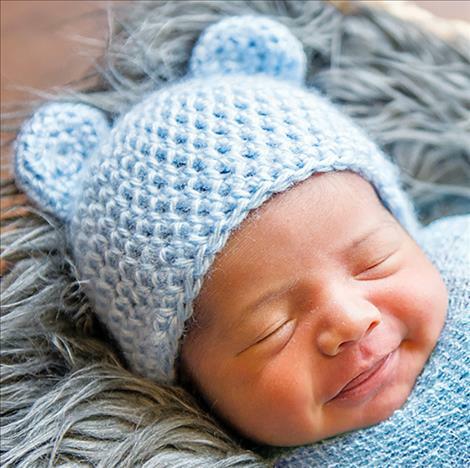 Logan was born on Nov. 12, 2017, at the Nesting Place in Providence St. Joseph Medical Center. 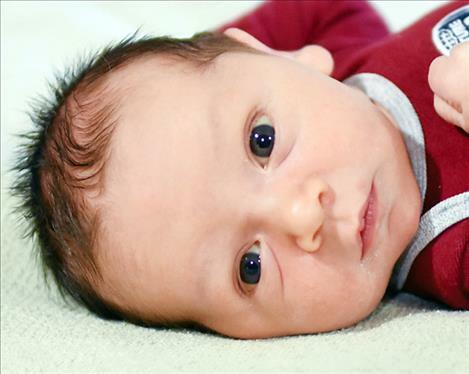 He was 19 and three-quarters inches long and weighed 7 pounds, 1 ounce. Logan’s parents are Lily Stops and Thomas Frank TenBear of Pablo. Maternal grandparents are Leslie Plainfeather and Martin Stops, Sr. Maternal great-grandparents are Lois Stevens and Woodrow Plainfeather. Paternal grandparents are Mary and Thomas TenBear, Sr. Paternal great-grandparents are Alice and Frank Laforge. RONAN — Ramzey Rene Jaeger was born Nov. 21, 2017, at St. Luke Community Hospital. 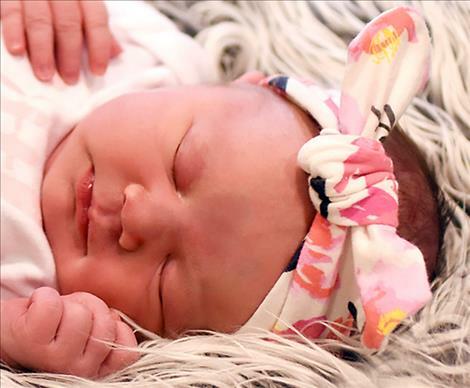 She weighed 8 pounds, 9 ounces and joins siblings Kendyl, Blane and Rhett Jaeger. Parents are Tommy and Kyla Jaeger of Polson. Paternal grandparents are Leanor and Harvey Peterson of Polson. Maternal grandparents are Lori and Sid Seay of Polson and Richard and Chrystal McDonald of Plains. RONAN — Terrance Stanford was born Dec. 5, 2017, at St. Luke Community Hospital. He weighed 5 pounds, 7 ounces and joins sibling Sage Mitchell Stanford. Parents are Roy Stanford and Jade Mitchell of Ronan. Paternal grandparents are Clayton E. Huffman and Hollie Howell of Miles City. Maternal grandparents are Rocki and Penrod Davis of Ronan.